Allen County Parks is committed to helping you out with tough job that you all have! Between budget cuts and testing we’re not sure how you do the wonderful things that you do, but we’d like to help!! We can design programs to meet your curriculum needs and help you meet Indiana State Standards! Pond life with macro-invertebrate and amphibian identification using pond nets, dippers and field microscopes. We can also customize a program to meet any requirement you might have! Give us a call and give us a try! Contains 605 acres, including the 270 acre Fox Island State Nature Preserve, windblown sand dunes, marsh (with overlook) remnant of the Little Wabash River, wetland forests, restored prairie, geo-garden, fossil pile, seven miles of hiking trails, three picnic shelters, cross-country skiing, hayrides, bird observatory building, Nature Center, and sandy beach at Bowman Lake. Contains 250, acres including the 120 acre Meno-aki State Nature Preserve, Cedar Creek State Scenic River, four miles of hiking trails, prairie, picnic shelter, sandy beach with pond, cross-country skiing, hayrides, sledding hill, bird viewing room, open field for recreational activities and the Goeglein Nature Center. In addition to these two great parks the Department also maintains and operates a unique experience at Deer Run Wilderness Area. Visit our Deer Run Wilderness Area page by clicking here to learn more. Deer Run is not your typical field trip but may be useful especially for older students or team building for athletic teams etc. Don’t have the time for a field trip and not sure when in the next two weeks you would have time for a naturalist to visit your class. Check out this idea, borrow our Tree Bio Box and when time allows in a 2 week period do your program! ITS FREE!!! This box includes books and curriculum binder of activities with all the supplies in one box. All you need is one tree! Call 449-3180 to check the entire box out for 2 weeks FREE! This box is available for check out at Fox Island County Park ONLY! 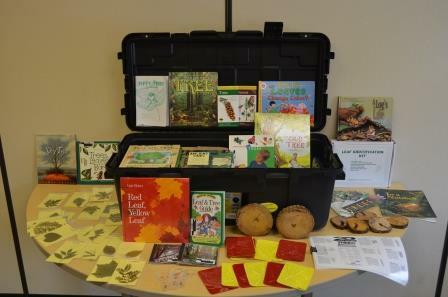 Complete with over 30 books, posters, tree cookies, leaf identification kit, magnifying glasses and much more. A special thanks to one of our supporting organizations, the Fox Island Alliance for this awesome teaching tool!! Nature Centers at both Fox Island and Metea County Parks are open daily from 9:00AM-6:00PM with full bathrooms, large classrooms, gifts shops, library and nature exhibits. Program Fee is $2.00 per student / parent chaperone for a 1.5 hour standard field trip program (on or off-site). $1.00/student/additional 1/2 hour. Paid school staff and bus drivers are FREEEEE!!!!!!!!. Hayrides are $3.00 per student. A themed craft or snack may be added to your program for an additional $1.00 each per student. Cross-Country Ski programs for 4th and 5th grade classes are $5.00 per student, $6.00 per adult, and include park entry fee and ski rental for one hour. Self-Guided entry fee is $2.00 per person for the entire day. Let us know you are coming. FIELD TRIP GRANTS FROM TARGET!! Check out this link to find out how you can apply for a grant valued at up to $700 for your field trip. Wonderful idea for these budget strapped times! We can also serve as your teacher workshop/training facility. Call or check out Rental Facility page to get more information on holding your event at our parks!